The Chevrolet Silverado (along with its GMC counterpart, the GMC Sierra), is the latest line of full-size pickup trucks from General Motors. Although General Motors introduced its first pickup truck in 1930, the term "Silverado" was a designation used only to detail the higher level trim for the Chevrolet C/K pickup trucks and Suburbans from 1975 through 1999. GMC used a few variations of the "Sierra" name (Sierra, High Sierra, Sierra Grande, Sierra Classic) to distinguish the different trim levels through 1987, though the "C/K" nomenclature was continued through 1999. "C" (or "R" for 1987) trucks had rear-wheel drive while "K" (or "V" in 1987) models had four-wheel drive. Both Chevrolet and GMC dropped the "C" and "K" designations in 1999. However Chevrolet still uses the CK and the CC in their current model codes. The Chevrolet Silverado and GMC Sierra trucks have been essentially the same for their entire history. 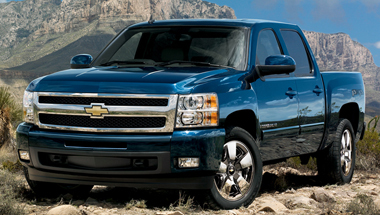 The Silverado today is generally advertised as the "lower" version, while the Sierra has more luxury options. 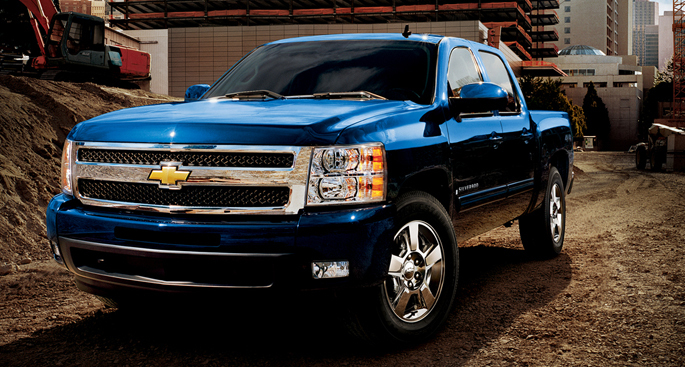 There are some trim and option variations as well as the addition of Chevy Silverado Accessories. Early models included variations in the engine and equipment, but the present differences are slight. The 1999 redesign included different car grilles and interior trim, and certain features were included at different times on the two trucks. 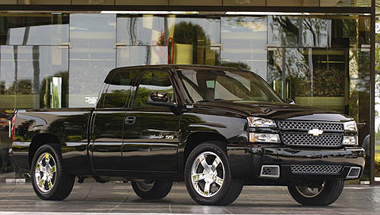 There are a number of models of light-duty Silverados, including the half-ton, SS, and Hybrid. The light-duty trucks generally use the 1500 name. They are available in three cab lengths, 2-door standard/regular cab, 3 or 4-door extended cab, and front-hinged 4-door crew cab. For the first year, only the regular cab and 3-door extended cab were available. A 3-door cab includes the Vortec 4300 V6, Vortec 4800 V8, and the Vortec 5300 V8. A 4-door extended cab was added for 2000, and output on the 5.3 L engine increased to 285hp and 325 lb·ft. The 6.0 L Vortec 6000 V8 was added for the 2001 Heavy Duty models, rated at 300 hp, with the GMC Sierra 1500 C3 getting an uprated 25 hp version of this engine. The Silverado Z71 got an optional lighter composite box, with a suspension package for towing, but lacked the high-output engine. The C3 became the Denali for 2002, and Quadrasteer was added.GM made a reworked version of the Silverado in 2003, with a new front end, and a slightly updated rear end. GMC created an upscale version of its Sierra 1500 in 2001 called the Sierra C3. It used all-wheel drive with a 3.73 final drive gear ratio and included the 6.0 L Vortec 6000 LQ4 V8 rated at 325 hp at 5000 rpm and 370 lb•ft of torque at 4000 rpm coupled to a 4L60E-HD four speed automatic transmission along with other upscale equipment. For 2002, the name was changed to Sierra Denali, but the specifications remained essentially the same. For the '07 model year, the Sierra Denali shares the same billet grille from the other Denali models, and also has the same dash as the '07 SUV's. The HD variant is a heavy-duty light truck. It is a strengthened version of the Silverado/Sierra light-duty, and is available in the 1500HD, 2500HD, and 3500 models. The 1500HD, introduced in 2001, offers a Vortec 6000 V8 with 300 hp at 5200 rpm and 360 lb·ft of torque at 4000 rpm with a Hydra-Matic 4L80E four-speed automatic transmission. The 2500HD also offers an available Duramax V8 with 360 hp at 3000 rpm and 650 lb·ft of torque at 1600 rpm. Also available is the Vortec 8100 V8 with 340 hp at 4200 rpm and 455 lb·ft of torque at 3200 rpm.